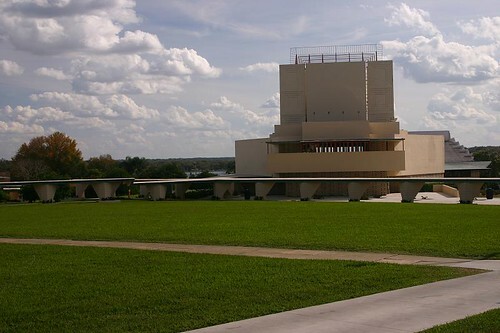 Florida Southern College (FSC), is a distinguished private college in Lakeland. Not only is it a respected college, but it is also home to the biggest collection of architecture designed by Frank Lloyd Wright located in one site, making it an irresistible draw for architecture enthusiasts. If you are planning on visiting Florida at some point, here is a guide to what you will find and the tours that are on offer. Wright was 69 and at the peak of his fame when he started work on the campus. He designed the buildings following a proposal by Ludd M. Spivey, who was the president of FSC at the time, who wanted to plan a new kind of college during The Great Depression to increase enrolment. Wright thought that many colleges could do a lot better architecturally, and so he accepted. Due to the presence of the buildings, it is no surprise that FSC’s campus was voted the most beautiful in the USA by The Princeton Review in both 2011 and 2012. You can see just how attractive it is by arranging a tour to visit the collection, and there are a number of options to choose from. The self-guided tour is available most days and is completely free. You can visit at any time and after picking up a map in the visitor centre you can spend as much time as you want admiring the buildings’ exteriors. There are also guided tours available, including the Basic Tour and the In-Depth Tour. The Basic Tour lasts an hour, and during the tour you will find out all about each of the structures from an expert guide, who will also take you inside Annie Pfeiffer Chapel. On the In-Depth Tour, you will also get to go inside all the buildings when possible, and it lasts an extra hour. Reservations are advisable for all guided tours, but not essential. The college also offers group tours, private tours for up to six people, and the Behind the Scenes Tour, on which you will get to see places that are not available on the other tours. There is also an Archives Tour available, on which you can find out more about the McKay Archives, which includes designs and photographs by Wright. Make sure you also visit the Visitor Centre during your trip. This opened in 1992 and is located in the William M. Hollis Exhibition and Seminar Room. Here you will find drawings, photographs and other artefacts, as well as exhibits designed by Wright that are on loan from other sites. If you are not staying in Lakeland during your time in Florida, it is still easy to reach FSC. Lakeland is not far from Tampa, so you can easily arrange a day trip here. It is slightly further from Orlando, but it is still an easy drive, you can rent cars from the airport from Alamo.co.uk. 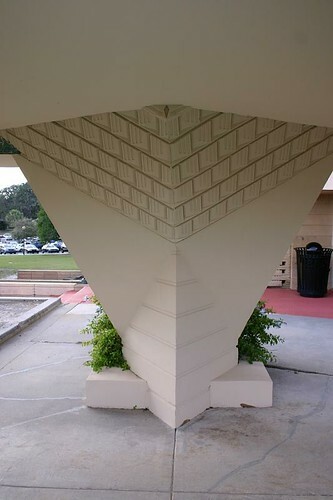 Florida Southern College is a worthwhile attraction for any architecture enthusiast, and especially for fans of Frank Lloyd Wright. It may not make it onto the main list of attractions for things to do in Florida on your holiday, but it is certainly worth taking a tour and enjoying one of the most important architectural sites in the state. The city of Chongqing may not be the first place you think of visiting when planning a trip to China. However, the area has a host of natural landscape features including gorges, caves and hot springs to entice you. I’ve always wanted to go to Nepal. Ever since I can remember, I’ve wanted to see the Himalayas and explore the crooked, rickshaw-crowded streets of Katmandu. When I finally went with my (new) wife and her kids a few years back, I wasn’t sure what to expect. I’d spent some time in Korea and Thailand as an English teacher before I got married, so I was relatively confident I could handle anything that Nepal had in store for us. I was completely wrong. Nothing could have prepared me for Katmandu. It was a different world, completely unlike anything I’d ever seen before. Barefoot children competed with mangy stray dogs for scraps of food in enormous piles of rotting garbage that spilled haphazardly into the street. Humpbacked cows wandered free and unmolested, lying down in the middle of intersections and ignoring horn-blasting drivers and the press of passerby. Electric rickshaws sprouted clouds of thick, black smoke as they chugged past street corners where hawkers sold kukri knives and bead bracelets carved from sandalwood. Lepers, their faces ravaged by crusty, greenish-yellow scabs, crawled through the crowds on whatever was left of their limbs. Sandwiched between buildings were Hindu shrines—statues of Ganesh and Shiva decorated with bright red tikka powder and garlands of orange chendumalli. Then there were the monkeys. The first thing you need to know about the monkeys that live in Kathmandu is that they don’t look anything like the monkeys you see on television. The monkeys that live in Kathmandu are rhesus monkeys—ugly, tan monkeys with dark, beady eyes and vicious teeth. The second thing you need to know is that Rhesus monkeys are violent scavengers. They hang out in packs, in plazas and on top of temples, screeching and snarling at anyone who gets too close. They will not hesitate to attack anyone foolish enough to carry food on their person. Needless to say, rhesus monkeys are dangerous—but no more so than raccoons. If my wife and I had been traveling alone, monkeys would not have made our list of top five things to worry about. We were not traveling alone. We were traveling with my wife’s kids, both of whom were exposed to Disney movies like Tarzan and Lion King at a very young age, and were consequently raised to believe that rhesus monkeys are friendly, humorous creatures. We did our best to keep Daniel, my stepson, and his sister, Hanna, away from the monkeys we encountered. If you’ve ever taken small children with you to Southeast Asia, you know that this is actually much more difficult than it sounds. So it wasn’t long before Daniel and I met a man who’d managed to get a leash around one of the little monsters and was offering to sell it for 500 rupees (about $6.00). Daniel immediately asked if we could buy the terrible little creature. I tried to explain to Daniel that it would be impossible to take a half-wild Rhesus monkey home with us, but there are certain facts that ten-year-olds simply refuse to accept. When I told my stepson that they wouldn’t let us bring a monkey on the plane, he suggested that we mail it to our home address back in the states. When I told him we couldn’t mail a monkey to America, Daniel tried to convince me that we could smuggle it onto the airplane in a duffle bag. This conversation went on for some time, mainly because the man holding the monkey’s leash kept lowering the price, insisting that the monkey was tame and that it’d make a great pet. Eventually, my wife and her daughter—who’d been exploring a jewelry shop across the street—wandered back to join us. Before I had a chance to explain the situation to my wife, the monkey decided that it’d finally had enough. It leapt from the man’s shoulder and landed on top of Hanna’s head, where it got tangled in her hair and panicked, scratching and biting before stumbling to the ground and scampering as far away as its leash would let it get. The whole thing was over in a split-second, before I or my wife had a chance to react. Hanna screamed and started crying, frightened but still okay. My wife scooped her up and tried to comfort her while I bellowed angry curses at the man holding the leash, who’d suddenly lost the ability to speak English. My wife managed to calm Hanna down and the four of us piled into a nearby taxi. We told the driver to take us to CEWIC (a nearby clinic that catered to expats and tourists) so we could get Hanna a rabies shot. There we were, dealing with a frightened, sobbing eight-year-old who’d just been attacked by a wild animal and Daniel still wouldn’t give up—he absolutely insisted on listing off more reasons we should buy that damn monkey. According to Daniel, the monkey’s violence against his sister was not a reason to refrain from purchasing the animal. With the impeccable logic of a ten-year-old who won’t take no for an answer, he explained that the monkey’s ferocity was actually a good thing. The animal would double as both a pet and an extra source of protection, attacking any burglars who tried to break into our house. Needless to say, my wife and I had finally run out of patience. While my wife dealt with Hanna’s rabies shot, I dragged Daniel outside and explained to him, in no uncertain terms, that if he didn’t shut up about the monkey, his mother and I would sell him to the man who’d been holding the leash. I have to admit, it was not my proudest moment. I’m ashamed of how quickly I resorted to deceitful fear tactics, but cut me some slack—I’d only been married to his mom for six months and I was still getting the hang of the whole parenting gig (which, for the record, is absolutely nothing like teaching). In my defense, any day that includes an animal attack and a visit the doctor qualifies as an incredibly stressful day—especially when you’re in a foreign country. After obtaining degrees in English Literature and English Secondary Education, Sean Lords went to Seoul, South Korea where he lived for three years teaching English abroad. He has since returned to the States, married, and is currently working on his Master’s degree. TopkapiPalace was built by Sultan Mehmed II who conquered Constantinople. Construction for Topkapi began in 1460 and was completed in 1478. The palace served as the primary residence of the Ottoman Sultans for around 400 years (1465-1856) of their phenomenal 624 year reign. While the palace has been altered and expanded upon many times, Topkapi retains its original layout and remains true to its original Ottoman baroque architectural style. Topkapi is situated on Seraglio Point overlooking the Sea of Marmara and offers stunning views of the Bosporus from various points inside the compound. It is a hilly site and one of the highest elevations near the sea. The acropolis of the ancient Greek city of Byzantion once stood on the site. There is an underground cistern built by the Byzantines in one of the courtyards which was used throughout the Ottoman period. Of interest, also on the grounds are the remains of a small Christian Church which were recently excavated. The builder, Sultan Mehmed II, was responsible for Topkapi’s basic layout. His private quarters were at the highest point of the hill on which the palace was built. The palace is made up of four main courtyards and several smaller buildings sweeping toward the Bosporus shore. The palace was home to 4,000 people at its height. The entire complex was surrounded by high walls, many of which go back to the time of the Byzantine Acropolis. Topkapi, unlike Versailles in Paris and Schonbrunn in Vienna, was not built subject to a strict master plan. Topkapi evolved over the span of many centuries with Sultans adding and changing various elements to meet their needs and tastes. This resulted in an asymmetrical architectural arrangement, though the main layout designed by Mehmed II is preserved. Most of the major changes to the TopkapiPalace can be attributed to the reign of Suleyman from 1520 to 1560. Under Suleyman, the Ottoman Empire expanded considerably and Suleyman wanted his residence to reflect this glory. Many new buildings were constructed and many existing ones enlarged during his reign. Following a fire in the kitchen in 1574, Sultan Selim II rebuilt and expanded the palace rooms that were destroyed. This restoration led to the expansion also of the harem, baths, private rooms and many pavilions along the shoreline. By the end of the 16th century, Topkapi palace appeared very much like it does today. The palace is not one single structure, but a compound of substantial size. There is a variety of low buildings built around courtyards all connected with galleries and walkways. There are trees, gardens and fountains throughout the grounds to form a serene, refreshing environment. Life in the palace revolved around the courtyard. Topkapi was the primary residence of the sultan and his court. Originally it was also the seat of government and as such access was strictly monitored. The palace was a city unto itself containing mosques, hospitals, schools, bakeries and its own mint. Access and egress were of little consequence to the palace inhabitants as they had everything they needed within the confines of the palace. Attached to the palace was a society of sultan-approved artists and craftsmen referred to as the Community of the Talented which produced some of the best work in the entire Ottoman Empire. Residents of Topkapi lacked for nothing. This lifestyle was typical of Sultan’s palaces throughout the Ottoman Empire. In the early 1850’s, the palace became unable to handle all the requirements of state ceremonials and protocols and the sultan moved his court to the DolmabahcePalace on the Bosporus. Topkapi palace today is a museum. It became a museum by government decree in 1924. The palace museum is a vast complex of hundreds of rooms, but only a few of the most important are accessible to the public. Nonetheless, treasures abound and should not be missed. Besides fine examples of Ottoman architecture, there are large collections of porcelain, imperial robes, various weaponry, Ottoman miniatures, Islamic calligraphic manuscripts, murals, Ottoman treasures and jewelry. Needless to say Topkapi is heavily guarded. TopkapiPalace is one of the wonders of Turkey because of these treasures and artifacts but also because of the light it shines on the life and times of the Sultans of the Ottoman Empire, one of the wealthiest empires the world has ever known. The Grand Bazaar in Istanbul, Turkey is one of the largest and oldest covered market places in the world. The bazaar is comprised of 61 covered streets and over 3,000 shops attracting from 250,000 to 400,000 visitors every day of the week but Sunday when the bazaar is closed. The Grand Bazaar is located within the walled city of Istanbul in the city’s center. Construction of the Grand Bazaar’s central space began in 1455 A.D. just after the Ottoman Empire conquered Constantinople. The Ottoman Sultan, Mehmet II, constructed a building to house the trading of textiles. The building was completed in 1460. Very near the building was a center for bakers, a slave trading market and a second-hand store. Around 1545, Mehmet II, no longer a Sultan, built another market and moved his textile trade business there while the original market devoted its trade to luxury goods. First these two buildings were distinct trading entities. Little by little, though, shops formed between and around the buildings giving birth to a comprehensive shopping center conveniently in a single location. Perhaps this was the original one-stop-shopping convenience department store so popular today. The beginning of the 17th century saw the Grand Bazaar in its final configuration. The vast extent of the Ottoman Empire covering three continents, and the empire’s control of roadways between the continents of Asia and Europe established the Grand Bazaar as the hub of trade in the Mediterranean region. At this time, there were 3,000 shops comprising the bazaar with out-buildings for storage. There was no roof over the marketplace as yet. Continuous devastating phenomena both natural and unnatural primarily fires and earthquakes plagued the area from 1515 to 1894, the year of a strong earthquake that wracked all of Turkey. Before the last quake according to an 1890 survey the Bazaar had 4,399 active shops, textile traders, 2,195 rooms, a mosque, many fountains and a mausoleum. After the 1894 earthquake only nine shops remained enclosed within the structure. The original textile market was defunct by 1914 due to intense European competition and was acquired by the city of Istanbul. The former market became an auction house for the famous Turkish carpets. The last restoration of the huge complex took place in 1980 following previous rehabilitations due to fires in 1943 and 1954. The Grand Bazaar that is seen to this day is the product of that final 1980 reconstruction. This thriving originally Byzantine market employs 26,000 people and is one of the major attractions in Turkey. The year 2011 marked the historic landmark’s 550th birthday and in that year was the most visited monument in the world according to the Grand Bazaar’s Artisans Association. The bazaar today consists of jewelers, goldsmiths, small antique shops, tailors, and carpet and textile dealers. There are also vendors hawking souvenirs, designer original handbags, clothing and other such luxury items as well as the usual knock-offs of designer fashions and expensive watches. Visitors to the marketplace can find everyday items at modest prices to priceless antiques, artworks and jewels. Price haggling is expected for all goods regardless of cost. Along with the thousands of shops are several hundred small restaurants, coffee and tea shops. The bazaar is a city within a city with all the smells, labyrinthine pathways, raucous voices and noises of a large metropolitan area. It is one of the most colorful places on earth. The significance of the Grand Bazaar lies not only in its rich history but in the richness it adds to the lives of locals and tourists in modern times. There are many covered market places in the world, but none so unforgettable as Istanbul’s Grand Bazaar. The Bosphorus, also known as the Istanbul Strait, is the body of water that defines a portion of the border between the European and Asian continents, both of which are located in the country of Turkey. The Bosphorus joins the Sea of Marmara with the Black Sea in Istanbul, Turkey to complete the separation of the two continents lying within one country. Evidence supports the theory that in ancient times the northern end of the Bosphorus was blocked by dirt and rocks. There was no outlet to the Black Sea at this time. The water level of the Black Sea was below that of the Aegean Sea, the Sea of Marmara and the Bosphorus. An earthquake removed the blockage to the Bosphorus and water flooded from the Bosphorus into the Black Sea inundating the coastal settlements. This could be the source of the legend of Noah’s flood and the myth of Noah’s Ark considering that Mount Ararat is also in Turkey. Navigating the Bosphorus has always been a challenge. As stated earlier the Bosphorus flows like a river between the Black Sea and the Sea of Marmara. The current becomes very strong in places, which is difficult enough to navigate. Add to this the fact that below this surface current is another current flowing in a direction opposite to the top current, and it is clear that the strait has always been and always will be a constant threat to ships attempting to cross it. The Bosphorus has been a waterway of significant importance since the most ancient of times. Ulysses passed through the waterway and Byzas, the founder of Byzantium, sailed the Bosphorus up and down in search of an ideal place to establish a village. It should be noted that Byzantium became Constantinople named after the Roman Emperor Constantine who ruled Byzantium from 272 to 337 A.D. Constantinople is now known as the present day city of Istanbul. There is no place else in the world where one is able to cruise down a waterway between two continents while remaining in one country. This is awesome in itself. Add to this wonder that the Bosphorus is the world’s narrowest strait still used for international navigation to this day. The shores of the Bosphorus are heavily populated as the major city of Istanbul actually straddles the strait. For the residents and tourists alike there are two bridges that cross the strait so one can move easily between the Asian part (Anatolia) and the European part (Rumelia). The first bridge, known as the Bosphorus Bridge was completed in 1973. The second, Bosphorus II, was completed in 1988 and is about three miles north of the first bridge. Of interest, there is a third bridge in the planning stages that remains top secret as the Turkish government does not want to encourage a huge boom in land prices in the area, which is sure to be the result once the word gets out. The Turks love their Bosphorus. Cruising down the Bosphorus at night offers the most magnificent view of any city anywhere in the world. Ephesus began life as an ancient Greek settlement, then a major Roman City on the Ionian Coast, which is now present day Seljuk, Izmir Province, Turkey. Ephesus is the best preserved of the classical cities of the Eastern Mediterranean. Ephesus is also cited as one of the seven Churches of Asia mentioned in the Christian Bible’s Book of Revelation and there are many claims that the Gospel of John was written here. One of the most striking features of Ephesus is how many layers of civilizations are laid bare for all to see, walk through and gain inspiration in the present day. Ephesus’ environs were already inhabited in the Neolithic Age circa 10,000 B.C. as has been revealed in archaeological excavations. The Bronze Age which followed exhibits burial grounds from the Mycenaean era circa 1500 B.C. where ceramic pots have been discovered. Historical scholars believe the area surrounding Ephesus was founded as a territory called Apasa notable as a Bronze Age 14th century B.C. settlement of Hittites. Homer refers to the area as Ahhiyawa in the period of the Mycenaean Expansion also during the 14th century B.C. Ephesus as it is called today was established as an Attic-Ionian settlement in the 10th century B.C.. Legend has it that Prince Androcles of Greece founded the city after being forced out of Athens upon the death of his father. He considered Ephesus as the true site of the Oracle at Delphi. Ephesus was attacked by the Cimmerians in the 7th century B.C. The city rose from the ashes of this defeat very soon after its conquering. The 6th century B.C. was one of prosperity for Ephesus. In the following years, the Lydians and then the Persians claimed the city as their own. Alexander the Great in 344 B.C. easily captured Ephesus as the city offered up no defense. Upon the death of Alexander the Great, Ephesus was ruled by Lysimachus, a Macedonian companion of Alexander the Great. The preservation of the great works of art that are part of the Ephesus wonders of today is attributed to the period of Lysimachus. Any visitor to Ephesus will be astounded by the visible record of the many layers of civilizations that bring such an overwhelming sense of history to the place. There is unmistakable evidence all around of the ancient civilizations that once claimed this Mediterranean city as home and left their buildings, roads, temples, and way of life to posterity. Visitors to Ephesus today are allowed to walk along the streets as citizens would have when the various civilizations were thriving and alive. The streets, buildings, monuments and temples are well marked to give the visitor a better understanding of what they are viewing, when the particular structure was built, its purpose and historic significance. As one wanders throughout the various streets, buildings appear on different levels putting the visitor back into ancient times and ancient civilizations. Given the treasures to be discovered here, it is difficult to point to one or another and declare that as one of the seven wonders of the ancient world. The entire site is the true wonder of the ancient world and remains so to this day. The Grand Canyon, in Arizona, US, is one of the largest and most impressive example of erosion by water, along with Victoria and Niagara falls. It has been named as a UNESCO world heritage site, and one of USA Today’s seven wonders of the world, and both these titles mean that it is very well protected. The Grand Canyon is a series or gorges, spanning 227 miles and with cliffs reaching 5280 feet in height. Today it is primarily the site for the Grand Canyon National Park and tourist attraction, but less than 5 centuries ago it served as a place to live for Native Americans, the Pueblo people and after that Europeans immigrants. Because the Grand Canyon is located in a place such as Arizona, it makes the ideal site for a family holiday, or couple’s vacation for a fortnight. There are many historic parks, zoos and water parks located in Arizona, so you could fill your week with visiting these, and an awe inspiring visit to the Grand Canyon to finish it off. Because the Grand Canyon is protected by a National Park you can take tours and take the paths that make your day out safe. This entirely natural structure was formed as many as 40 million years ago, but it didn’t look the way it does now overnight. 40 million years ago was when the Colorado River was first formed; the same Colorado River that caused the flooding of much of western America and prompted the construction of the Hoover Dam in order to tame it. This river started from small tributaries and grew gradually into a lake, or basin. Currents within this lake started to form grooves in the river bed and the Colorado river started to snake in and out of the rock; eroding it over millions of years to form what we know as the Grand Canyon today. Along with the formation of the deep gorges that run through the grand canyon, and the cliffs that encompass them, are various caves which provided shelter for indigenous peoples and eventually European immigrants in the sixteenth century. Today, the water that runs through the gorges of the Grand Canyon continue to erode the rock around them, although we will not notice the differences in our lifetime. The Grand Canyon has taken 40 million years to get to this point, so who knows what the next 40 million will bring? There are three international airports near the Grand Canyon: Phoenix Sky Harbor, Flagstaff Pulliam Airport or The Grand Canyon Airport which is closest to the actual attraction. This may seem like the best choice at first, but it’s important to remember that you will want to stay in a more metropolitan area in order to find restaurants and thing to do on the days that you’re not visiting the canyon. For this reason it’s best to fly to Flagstaff Pulliam Airport and either rent a car from there, hire a taxi or take a bus to your hotel, or the attraction itself. You can choose from camping ground accommodation around the rim of the Grand Canyon, or alternatively a comfortable hotel in one of the towns nearby, such as St. George, Bullhead City, Flagstaff or even the ever-exciting Las Vegas. Spring Hill Suites is a great hotel in Flagstaff, which is also by highway 40 which runs to the Grand Canyon and has wireless Internet, room service, laundry services and a restaurant with room delivery. A couple’s room here for one night costs from $119 to $129. Alternatively, you could try a stay in Flagstaff’s Holiday Inn Express for $130 to $199 per night. There are many significant natural and man made shifts that happen on earth once a year: the change from winter into spring, the day the clocks go forward, the end of one year and the simultaneously beginning of the next. Yet perhaps one of the most impressive shifts that only one part of the world sees, is the Great Migration of Serengeti and Masai Mara. These vast national parks; the Serengeti within the country of Tanzania and Masai Mara reaching into Kenya, play host to a huge array of wildlife, including rhinos, elephants, giraffes, lions, wildebeests, cheetahs, hippopotami and many different species of antelope. The great migration of many of these animals begins in July, when they move from the increasingly hot southern Serengeti, to the cooler, northern Masai Mara. Then when the seasons shift and the Masai Mara becomes too cool again in around October, they come all the way back, some 100 miles, to the southern Serengeti again. The reason this great migration takes place is that the animals are constantly on the lookout for the greenest vegetation, and the largest bodies of water. As the Serengeti heats up, these dry out, or die out, and there’s nothing to eat or drink. This great migration is not done just for fun; it’s done for survival. Due to the location of the Serengeti and Masai Mara to the equator, and in eastern Africa, the climate here is loved by tourists, and the fact that rare species of animals can be seen is a huge attraction. As a result, there are many different safari tours. The animals of the Serengeti and Masai Mara have been migrating every year for millions of years previously. It’s a natural instinct that they should move either away from the hotter weather during summer, or further towards it during winter, in order to get enough food and drink. The Great Migration is not always a happy story, however. Predators who rely on the meat of other animals rather than fresh vegetation will follow the great herds of antelope, zebra and wildebeests, in order to kill and feed. Some animals, such as the lame or mothers with very young offspring, will find themselves lagging behind the bigger groups and as a result much more vulnerable to attack. The future for the Great Migration is shaky, depending on how global warming pans out. Since the Serengeti is so close to the equator, we may find that as Earth heats up, the animals cannot live there at any time of year. As a result, the boundaries of the Masai Mara national park may need to be extended towards the north in order to allow the animals access to water that hasn’t dried up, and vegetation that hasn’t died. There are several airports in Tanzania, so you will need to choose wisely to fly to the one that’s nearest the Masai Mara and Serengeti National Parks. The name of this airport is Kilimanjaro International Airport, which is situated near Arusha. KLM airlines fly regularly to and from this airport, and once you land there are rental vehicles available from the airport itself. We do highly recommend you fly to this, the nearest airport, however, as the roads around the Serengeti and Masai Mara are not always safe. Long car journeys should be avoided, if possible, unless you are taking a guided tour driven by an experience driver in an off road vehicle. We have compiled a list of three possible hotels in Arusha, near Serengeti National Park, since this is the area nearest to Kilimanjaro International airport when you land. Those on a tight budget could stay at La Jacaranda hotel for approximately $50 per night, including a restaurant and good quality rooms. For a slightly higher budget, try Kibo Palace hotel (rooms cost around $193 per night with swimming pool, gym, restaurant, room service and business center), and for those on a high budget, we recommend the luxurious African Tulip, for around $210 per night. Dotted around Guatemala, Northern Belize, Mexico and Honduras are remains of structures, buildings and monuments built by the Mayan people; an ancient civilization with a very rich history. Uxmal – the most extravagant and complex of all eight Mayan sites, built shortly before c.1000 AD. All eight of these structures can be seen within what is known as the ‘Mayan area'; a stretch of over 625 miles in the Mesoamerica region that is separated loosely into three sections: the northern Maya lowlands, the central/southern Maya lowlands and the southern Maya highlands. Each area has a different climate, and of course a different elevation. Today it is possible to visit all eight of the Mayan ruins, and using their locations to draw up an itinerary can make for one of the most enjoyable and fulfilling two-week vacations in the Western hemisphere. These eight entirely man made structures were built by the Mayan people between c.500 AD and c.1200 AD. However, after archaeologists found ancient remains in Cuello, Belize and carbon dated them, the culture itself is said to have been first founded as early as c. 2000BC or even c. 2600BC. Mayan culture didn’t come to its peak until the classic period in c. 250AD and the civilization started to collapse in c. 800AD; a process that went right up until c. 1200AD. Despite this, and the fact that there may have been many attacks upon the Mayan structures, buildings and monuments they built, the eight that still remain are largely in very good condition. Kabah in Yucatan, Mexico, for example, showcases the ‘palace of masks'; a room filled floor to ceiling with masks of what could be monsters, or the Mayan rain god Chaac. They are in exceptionally good condition with every one still present. Some of this preservation can be attributed to the fact that every one of the eight Mayan ruins is a UNESCO world heritage site (and therefore protected from damage), but we cannot deny that the Maya civilization was obviously exceptionally knowledgeable in building techniques, materials and the quality of their constructions. Belize lies on the eastern coast of the Maya area, but also mid way between most of the ruins. You can fly directly to Belize City Municipal Airport, which is not far at all from Belize city center; a busy area with lots to see and do, as well as lots of places to stay. This is a great place to use as your ‘base’ and then travel from there to see the ruins. There are several educational tours you can take of the Mayan ruins, many of which are done by coach. You may wish to choose a tour that provides you with accommodation along the way. The Radisson Fort George Hotel and Marina is a great choice of hotel for those on a mid range to luxury budget. At around $190 per night, you get access to the hotel’s swimming pool, business center, gym, restaurant and free parking. If your budget is a little lower, then you could choose from either the Black Orchid Resort, which offers rooms at around $110 per night (plus swimming pool, free parking and restaurant), or the Glover’s Atoll Resort for the much lower price of approximately $70 per night. Of course, these are just three options of hundreds of hotels in Belize City and the surrounding area. Nobody can argue that the creation of the Internet is not a huge achievement of our time. This worldwide computer network keeps people on the other side of the world at our fingertips, providing communication and information on just about anything almost immediately. Telephones have been allowing us to communicate with others farther than speaking distance since 1876, but while this was also a revolutionary development, the Internet allows us to do so much more. We can speak to other people on the Internet using software called Skype, but we can also see them using Skype video calling too. What’s more, we can set up web pages to convey information that anyone can access, at any time of day and spend however long they want to looking at it, reading it, or interacting with it. It has, in effect, completely changed the way we interact with the world around us, as we can find out about news stories the instant they are published, not only via news organization websites, but also through word of mouth on social networking sites such as Twitter. In today’s society the many millions of network connections that make up the Internet have become invaluable. Business conglomerates rely heavily upon it to organize sales and deliveries, and a huge portion of modern advertising takes place online. It was estimated in 2009 that one quarter of the entire population of the world now uses the Internet, and as computer resources improve and servers become more powerful, this number is only expected to rise. The very first examples of the Internet were developed as early as 1960, just after NASA had launched the robotic space craft Sputnik and subsequently needed networks to link the radar systems at opposite ends of the USA together. This program soon developed into a larger network and was linkable to other networks such as one developed for the US Air Force by Paul Baran. Email and Internet Service Providers (ISPs) didn’t come about until 1988 when the US Federal Networking Council began to work on making it commercially available. The most popular ISP throughout the 1980s and 1990s soon became Telenet (later renamed Sprinter), as this network had been present in various US cities from 1970, but as yet only governments had been authorized to connect to it. The development of the Internet took almost thirty years, and it wasn’t until the 1990s that it was finally made officially commercial and people all over the world could use it. In fact, to say that the entire development took 30 years is untrue, as the Internet continues to develop even today, and as far as is foreseeable, at no point will it ever come to a standstill. The Internet can be accessed from anywhere that has a valid Internet connection. If your computer has a wireless card, then you can connect to the Internet anywhere you go without needing to be plugged into anything, although computers without wireless cards need to be plugged into a house or building’s wall in order to access the World Wide Web. To get an Internet connection you first need a computer with a built in modem. If you have a laptop and wish to access free wireless Internet offered in many cafes and libraries then you’ll want to install a wireless card too. For desktops it’s quite easy, however, to simply connect directly to a modem using an Ethernet cable. Next, you will need to choose an ISP (Internet Service Provider), choose one of their payment programs and book an appointment for them to connect you. This might involve visiting your house, or sometimes just connecting you over the telephone. Providing there’s a WiFi (wireless) signal around, any Internet enabled device (be it a laptop computer, smart phone, video gaming console or cell phone) you can access the Internet and almost any web page on it. In fact, if you’re reading this then it’s almost certain that you’re already there! As planet earth lies on an axis, it has two poles that are at the northernmost and southernmost points all through the year. Due to their distance away from the sun, these two poles are also the coldest parts of the earth, and spend the majority of the year completely frozen into what’s better known as the Polar Ice Caps. The Polar Ice Caps do experience seasons, but they are very different to the ones that we are used to. During summer, the days continue into the night, with the sun never setting and darkness never arriving. During this season a large amount of the polar ice caps melt, only to freeze again when it turns to winter. Of course, during winter, there are no ‘days’ but only dark night for months on end. There are some areas of Iceland, near the polar ice caps, that experience these seasons and are also inhabited by people. It’s these areas, such as the city of Reykjavik, Iceland, that are the best places to visit if you want to see the polar ice caps in person. You can even visit the lagoons which have hot springs, warm enough to bathe in. Outside of these particular areas, however, the polar ice caps are uninhabitable. It’s only on their outskirts that peoples such as Inuits have set up their homes. The hostile weather, extreme temperatures below 0 and lack of vegetation makes it very difficult to sustain a family there. The polar ice caps have been present on earth for many millions of years and were most certainly not built by man. The north pole has an average temperature of -34° Fahrenheit, while the south pole is generally much colder. The polar ice caps have, for years, been a central part of keeping the earth cool. They don’t do this by being cool directly, but instead by their ice reflecting the sun’s rays away from the earth’s surface. Now that they are melting increasingly fast, they are losing this ability to stop the sun’s rays from warming up the earth, and as a result global warming is perpetuated. NASA have been monitoring the ice caps since the 1970s, and have found that they are melting fast. There is a specific type of ice that stays frozen all year round, known as ‘perennial ice’ and between 1980 and 2000 the amount of this ice has reduced by 20%. The future for the polar ice caps looks bleak, depending on how global warming progresses over the next few decades. While little ma happen before 2050, we could be seeing increasing numbers of floods, tsunamis and much heavier precipitation. Reykjavik has its own airport, where Icelandair flights regularly go to and from the city. From the east coast of America this should take no longer than six hours. From Reykjavik airport you can then fly by helicopter to various destinations, including Jokulsarlon lagoons with their hot springs, but you should be aware that this is the most expensive way to travel. There are also several buses and train services running to and from the airport, and you can visit central Reykjavik to do some sight seeing via bus, too. For direct transport to your accommodation, try one of the many taxis that wait at the airport. Hotel Reykjavik Centrum is a high class hotel right in the center of the city. Here you’ll find luxury rooms, at around $250 per night. This is, of course, the most expensive option and many visitors will prefer to keep to a more modest budget. If this is the case then you may wish to try the Hilton Reykjavik Nordica where rooms are around $140 per night. The best budget option for good quality hotel accommodation in Reykjavik are the Castle House Luxury Apartments, which cost around $77 per night. This hotel also has free high speed Internet. Towards the north-east of Israel lies the Old City of Jerusalem, a religious site housing over 200 monuments pertaining to Christianity, Judaism and Islam. The entire site stretches 0.35 square miles within the modern city of Jerusalem, and is contained within walls reaching between 16 and 46 feet in height. Four quarters make up its area, the Christian quarter, the Muslim quarter, the Jewish quarter and the Armenian quarter, each of which reflecting the cultures and traditions of the relevant religion or ethnicity. The Jewish quarter is home to one of the most famous and revered monument in Judaism: the Western Wall. Jewish people take pilgrimages to the Old City of Jerusalem to visit this wall, also known as the ‘wailing wall’ and ‘Kotel’ and pray at it. Within the Christian quarter lies the Church of the Holy Sepulchre; one of the holiest places in the world for Christian people, as the Sepulchre is said to be Christ’s tomb, and it’s believed that it was here that Jesus was also crucified. The Christian quarter borders onto the Muslim quarter, which is the largest of ll four and has a significant population, and houses Temple Mount; a very important religious site for Islam and Judaism. Today the Old City of Jerusalem has been reconstructed in various places (including the surrounding city walls) but only to the point where it accurately reflects the way that it looked when it was first built in the year 70 AD. The Old City of Jerusalem wasn’t expanded upon until around 1860, when it began to grow outside of the Old City walls, into what we know today as modern Jerusalem. Before this expansion, the Old City of Jerusalem dated back to the year 70AD when it was built by the settlers and rulers there at the time. The four quarters that it is comprised of have existed for many centuries since, but they have not always been within the same parameters that they lie in today. The layout of the Old City of Jerusalem that we see today was not built until the 1800s. Several wars and disputes have rocked the Old City of Jerusalem since it was built almost 20 centuries ago. The most recent happened on April 13th 1990, when Greek Orthodox Christians and Palestinians were protesting against Jewish people living in the Christian quarter. Before this the most significant war was during the Arab-Israeli war of 1948 when much of the Jewish quarter of the Old City of Jerusalem was destroyed. In between these two catastrophic events, the Old City of Jerusalem was named as a UNESCO World Heritage site in 1980. Because of this various areas of the city are protected. The nearest airport to the Old City of Jerusalem is Atarot airport, although unfortunately this has had to be closed due to violence and fighting in the region. Therefore, visitors to Jerusalem will need to fly to Ben Gurion International airport to the west (and closer to the coast) of the city. From here it’s a 45 minute drive to the Old City, so you may wish to find a hotel that is halfway within that distance. From the airport there are various buses and a high speed railway service to the center of Jerusalem, and closer to the Old City itself. For mid to luxury range accommodation, try the Crowne Plaza Hotel, Jerusalem. At this hotel you will find rooms start at around $150 and go right up to $650 per night for an extravagant stay. The Jerusalem Gate Hotel, on the other hand, offers mud range stays for visitors on more of a budget. Rooms here are usually around $120 per night. If you’re looking for budget accommodation, then the Jaffa Gate Hostel in Jerusalem is perfect. Rooms start at around $50, unless you wish to stay in a shared dormitory where rooms are much cheaper (around $20 per night). Standing at 170 meters tall, and 400 meters wide from east to west, the Potala Palace is home to thirteen stories of rooms, each of which were mostly used for and by the various Dalai Lamas who inhabited it. Each of the palace’s surrounding walls – built atop the 100ft tall ‘Marpo Ri’ hill – slope towards the bottom, where they are at their most thick; some reaching up to 16 feet in width. If it weren’t for the fact that they were thinner at the top, it would be a huge surprise that the palace had ever been damaged, as it was by Chinese shells during the Tibetan uprising in 1959. It had also been damaged many years before that, again by war but also by various lightening storms, and it wasn’t until the fifth Dalai Lama came to live in Potala Palace in the seventeenth century that it was rebuilt to be much the same palace that we see today. Potala Palace is not simply one building with many rooms, but various different palaces all built into one. There are halls where the Dalai Lama used to hold political conferences and talks, courtyards where entertainment such as opera would be held, chapels for worship and murals painted on the walls of this luxurious location. Today Potala Palace provides no residence to anyone, as the Dalai Lama is no longer based there, but it is instead a museum of Chinese life that anyone can visit at any time of year. Potala Palace was built originally in the year 637 by the Chinese, under the commission of the Emperor Songtsen Gampo. The Emperor wanted it to function as a place where he could retreat to and spend time in meditation. At the time, however, Potala Palace looked much smaller than it does today, as it was during the 1600s that additional palaces were added on to it, to form the structure that we know today. In between Emperor Gampo’s inhabitance and this great expansion, Potala Palace suffered damage from wars and lightening strikes, which actually prompted its restructuring and the expansion in the first place. During this time it was also the primary residence for spiritual leader of the Tibetan Buddhists, the Dalai Lama. Each successor to the original Dalai Lama took residency at Potala Palace right up until the 14th (and present) Dalai Lama, who fled from the palace in the late 1950s to India when there was an invasion from the People’s Republic of China. Since this event, Potala Palace remained briefly empty, before being renovated to its former glory and turned into a modern day museum of the history of China. Potala Palace is located in the city of Lhasa, which is also home to the Lhasa Gonggar Airport. The airport is around an hour and a half away from Potala Palace by car, but if you find a hotel in the middle of this distance you will break up the journey nicely. Once you arrive at Lhasa Gonggar airport you can catch a train, bus, taxi or rented bicycle to your accommodation. Lhasa City is located in South Eastern Tibet, not far from Bhutan and Nepal, so if you’re planning a long holiday you could visit these countries too. If you’re looking for a budget hotel stay near Potala Palace in Tibet then a good choice is the Shang Bala Hotel; a 3 star accommodation on Dan Jie Lin road, Lhasa. Rooms here are, on average, $55 per night. A good mid-range to high value hotel in Lhasa, Tibet is the four star Jardin Secret Hotel on Jhinzu West road, where rooms cost around $75 per night. However, if you’re looking for a more luxury, expensive stay in Lhasa then try the Jin Bo Grand on Linkuo North Road, where rooms are around $175 per night. The Panama Canal is one of the largest and indeed the longest man made structure in the world. For many hundreds of years, since the 1500s, sailors and engineers had wanted to build a canal on this route, but construction didn’t begin until 1880. The purpose of the Panama Canal is to provide a shorter and safer route from the Caribbean Sea to the Pacific Ocean (and vice versa). Before the canal was built ships had to travel 14000 miles around Cape Horn, as opposed to the 6000 miles that the Panama Canal occupies. Construction on the Panama Canal ended in 1914 when it was opened and to this day it provides an incredibly important shipping route for freighters and large ships in Southern America. There are three sets of locks along the Panama Canal, each of which demonstrate classic engineering designs. There is currently an expansion programme in progress at the Panama Canal which proposes two new sets of locks, plus the deepening of the Culebra Cut and the widening and deepening of Gatun Lake. These efforts are expected to be complete by 2014, with construction having started at the end of 2006. As you can probably tell, the Panama Canal is located in Panama, a republic located on the isthmus connecting Northern America to Southern America. The climate here is tropical due to its location close to the earth’s equator, and given that Panama is surrounded by the sea and coastlines, much of the culture here is geared toward beach tourism for European visitors. This also means that despite the official language being Spanish, many people here speak English too. The coffee trade is also very successful here, meaning that many of the coffee shops and restaurants sell top quality drinks. The construction of the Panama Canal has, unfortunately, not come without great tragedy. By the time it was ready to be opened in 1914 it was estimated that 21,900 workers lost their lives in total. This was largely due to the extensive spread of yellow fever and malaria, but also because of the landslides that the building of the canal brought with it. Today, of course, the Panama Canal is entirely safe and visitors can travel down it in a matter of hours in anything as small as a yacht, up to anything as big as a cargo ship. Visitors to the Panama Canal can either fly to Tocumen International Airport (also known as Panama Airport: PTY) easily from other countries and continents. The Marcos A Gelabert International Airport is also located at the bottom (southern) part of the canal, so a journey can be taken from there, to the north of Panama also, although this airport is considerably smaller and many airlines may not fly to this port directly. From each airport it is easy to rent a car or motorcycle to travel to the canal, or alternatively jump in a taxi to get to the docking ports. Four star Hotel Bocas del Toro is located not far from the Marcos A Gelabert airport, so this may be your best choice if you have had a long and tiring flight. Rooms at this hotel start at $126 and go right up to $270 for rooms with an ocean-view balcony. For a budget stay, you can always try the Centroamericano hotel in Panama zone 3, where a room for one night will cost between $44 and $60. This one is a little further away from the Panama Canal, but it is also closer to the Tocumen main airport in the city. Of course, once you arrive at the Panama Canal itself the best and only way to travel is by boat or yacht. Getting to the canal’s docks, however, will require either a rental car, motorcycle/scooter, a taxi or one of the many buses that serve the republic. The best port to arrive at for tourists is the Pacific Port. Delta Works is a complex network of structures in the Rhine-Meuse-Scheldt Delta of the Netherlands. It was designed to shorten the length of the coastline along the Netherlands, to prevent the extensive flooding and storm damage these areas were experiencing. Construction on the Delta Works began in 1950, but these efforts were not intended to be completed at once, hence the ceasing of construction almost half a century later in 1997. The Delta Works consist of dikes, dams, storm surge barriers, sluices and locks. Oosterscheldekering is the largest structure in all of the Delta Work’s thirteen. It was originally intended to become a freshwater lake, but fishermen and environmentalist campaigners fought to keep Oosterschelekering’s estuary mouth open so that Oyster fishing could still carry on. It now has a storm surge barrier instead of a full dam. The Delta works have been named as one of the seven wonders of the modern world by the American Society of Civil Engineers and they are fully functioning today. Anyone can visit these structures at any time of the year, although some are only active when storm surges or other flooding threats are imminent. The Netherlands lies to the North-West of Europe, protected from the North Atlantic Ocean only by the United Kingdom. ‘Nether’ means ‘low’, which reflects its position in Europe; it is the ‘low lands’ which are susceptible for flooding, hence the need for the Delta Works. This country is home to tourist destinations Amsterdam and Rotterdam where there is a rich culture and many traditions. Besides visiting the storm surge barriers, sluices, locks, dams and dikes of the Delta works you may also wish to stay in one of these two cities for a short weekend or even a week long break. Although the Delta Works had been in construction for three years by this time, they were not quite built up enough to prevent the terrible flooding in the Netherlands in 1953 when around 2000 people unfortunately died. There has been minimal flooding since then, and each of the Delta Works structures is expected to prevent flooding for a minimum of 250 years. The total cost to build every one of the Delta Works structures is estimated at $7 billion. An immense 15% of this cost ($105 million) went on primary research to ensure that the structures were being built in the correct places to prevent flooding from happening again. KLM is the main and national airliner serving the Netherlands, but there is a range of airports you can travel to, depending on which of the Delta Works you wish to see. Amsterdam Schipol is quite far from the Delta Works area, although you may wish to stay there for a few days to look around the metropolitan city. Much nearer the Delta Works themselves is Zeeland airport; there is easy access from here to the A58 from here also, so you can rent a car after your flight in order to get around. If you choose to stay in Amsterdam before seeing the Delta Works then one budget option is the Best Western Apollo Museumhotel, or there is a luxury option of the Barbizon Palace Hotel; just over the road from the train station that takes you directly to Amsterdam Schipol airport. By the Delta Works themselves you can stay at the three star Golden Tulip Westduin in Vlissingen (a pretty, Dutch beach town) from $118 per night, or alternatively there is the four star luxury option at Amadore Grand Hotel Arion (also situated in Vlissingen) from $233 per night. There are both bus and boat commercial tours that take visitors around each of the Delta Works structures all year round. They provide food and drinks, as well as a tour guide fluent in English and Dutch and these tours usually stop at optimal viewpoints next to the dams, locks, sluices, dikes and storm surge barriers so they can be seen and photographed easily. Itaipu Dam is possibly the most quintessentially ‘modern’ of all seven modern wonders of the world, because it produces power for our millions of electric lights, showers, ovens, televisions and all the other gadgets we rely on so heavily today. To be more specific, the Itaipu Dam (located on the border of Brazil and Paraguay) is the largest hydroelectric power station in the world. It takes the gravitational force of the water against the dam and produces enough power from it to serve 78% of Paraguay and 26% of Brazil without any emissions into the atmosphere whatsoever. Construction of the Itaipu Dam on the Paraná River began in 1971 and didn’t finish until 1984; some thirteen years later. It’s been running non stop ever since it was opened, although more and more units have been added to the Dam so that it can supply larger areas. At present there is a total of 18 units. The Itaipu Dam is 100% more environmentally friendly than its popular coal power plant counterparts. Each year it prevents 67.5 million tonnes of carbon dioxide from being pumped into the atmosphere. It was named as one of the seven modern wonders of the world in 1995. The Itaipu Dam lies on the Paraná River, on the border between Paraguay and Brazil. Paraguay is one of the world’s largest countries, with a population of around six million. It has been given the nickname the ‘Heart of America’ as it lies right in the centre of south America and is entirely landlocked. Brazil lies to the north and north-east of Paraguay and has one of the world’s richest cultures, plus it has the fifth largest population on earth. The main language spoken in Brazil is Portuguese, whereas those in Paraguay speak either Spanish or Guarani. Itaipu Dam cost $19.6 billion to build, much of which went on re-routing the Paraná River. This was done to allow an older section of the river to dry out, for the dam to be built there, before being re-routed back to its original course. Another huge cost was the sheer amount of concrete needed to build the Dam, an amount which totalled 15 times more than what was used for the Channel Tunnel. The water inside the Itaipu Dam lake weighs an incredible 29 billion tonnes. It is this dead weight that allows the gravitational push of the water to be converted into power for Brazil and Paraguay. The nearest airport is the Guarani International Airport, just 2.8 kilometres west of the Itaipu Dam. There is a tourist agent called Paraiso Golf just 9.4 kilometres away from the airport, whose staff are there to help you to arrange a car rental or bus travel following your flight. Simply grab a taxi from the airport to this agency to arrange how you will visit the Itaipu Dam. Once you arrive at the Itaipu Dam by taxi, bus or rental car you can take a basic guided tour for just 15 Brazilian Reais, which equates to around $8.50 dollars. The nearest hotel to the Itaipu Dam is located in Iguazu Falls and is called ‘Best Western Casablanca’. Rooms here range from between $70 and $140. Alternatively you could stay at the Bella Italia Hotel in Iguazu Falls for between $65 and $113. Both of these hotel accommodations are within easy driving distance of the Itaipu Dam and they also both provide comfortable and good quality service to all guests. For luxury stays why not ask at the Paraiso Golf travel agency when you step off from your flight at the Guarani International Airport? If you have visited the Paraiso Golf travel agency to rent a car, then your mode of transport will already have been sorted out. At the Itaipu Dam itself visitors can take a free tour bus, where the tour guide is fluent in three languages. Passengers are taken along the Dam and also to the side of it so it can be seen in its full glory. In early January, 1933 construction began on the Golden Gate Bridge, a suspension bridge over the Golden Gate (North American Strait). The bridge was designed to make it possible to drive easily from the county of Marin to San Francisco city and its primary designer and engineer was Joseph Strauss. America’s Golden Gate Bridge stands out from others of its kind due to its orange-red color; picked out to help visibility in thick fog and also to complement the environment that surrounds it. Due to its photographic nature and esteemed beauty, the bridge was named one of the seven modern wonders of the world by the American Society of Civil Engineers, amongst the CN Tower, the Channel Tunnel and the Panama Canal. Since construction on the structure finished in 1937, the Golden Gate Bridge has been used for transporting a wide range of vehicles as it incorporates part of the California state route 1 highway and the US route 101. Anyone can visit the bridge providing they can visit the US and many people choose to stop before the bridge and take photographs from the surrounding landscapes. It also shouldn’t go unnoticed that the Golden Gate Bridge links to one of the USA’s most popular states – California – where there is much to see and do. The Golden Gate Bridge runs between San Francisco city and the county of Marin. San Francisco is the 12th most inhabited city in the US, meaning it is busy and vibrant. There are many theatres, concert halls, museums and a baseball park for tourists to visit during their stay. Marin, being a county rather than a city, is more toned down and has a strong association with new age concepts and therapies. It’s also a very beautiful place so if you enjoy photography or simply getting down to nature then it’s a great place to visit and find accommodation in. The Golden Gate Bridge finished construction at a cost of approximately $35 million, which was over $1 million under budget. This was great news for the San Francisco government who couldn’t afford previous plans for the bridge which stood at $100 million. Its full length is 8981 feet and it is 90 feet wide at any given point. In 1996 famous French record breaker Alain Robert (also known as the ‘human spider’) climbed up between two of the cables leading to one of the main cables that holds the bridge. In total Robert had climbed 745 feet. SFO is the acronym for San Francisco International Airport, which is where you will most likely be flying to if you are not already situated in the United States. It’s a large airport with a large range of different airlines, budget, mid range and luxury. There is also an airport in Marin county if you prefer to stay there. If you are already living in the United States, or are visiting another region first then you can also drive very easily to the Golden Gate Bridge, providing you find your way to either the California state route 1 or the US route 101 highway. If you are particularly interested in visiting the Golden Gate Bridge then it’s only right that we should provide you with a list of hotels that overlook it. For a budget stay there is a Travelodge hotel in Presidio, San Francisco. Alternatively, La Luna Inn is a modern and fresh boutique budget hotel with rooms between $89 and $109 per night. For a mid range to luxury stay you might like to visit the nineteenth century Victorian Casa Madrona hotel, which has rooms costing between $149 and $299 per night. Considering its great network of highways and the bridge itself, the best way to get around this area is to drive. Visitors to the area can rent a car right next to the San Francisco International Airport at ‘Thrifty Cars’. Or alternatively from Hertz Car rental just a little way down the Bayshore Freeway from the airport (it would be easy to catch a taxi to there). By the time the 1970s hit Canada, the country’s provincial capital Toronto already had several skyscrapers. However, none of these provided TV, radio or telephone signals for the rest of the city, which meant that signals here were weak. Plans went ahead to build a structure taller than all the rest that could project signals downwards onto the surrounding city and improve entertainment quality and communication. This was known as the CN Tower. At the point of the plans, engineers on the CN Tower and onlookers from the streets below were unaware that this would become the world’s tallest tower when it was to be opened in 1986. Today there is some controversy surrounding the ‘world’s tallest building’ title. The CN Tower’s website claims that it remains the tallest building in the world, whereas the Guinness Book of Records maintains that it is the world’s tallest free-standing tower. Either way, today the tower is used to transmit television, radio and cellular signals (e.g. Motorola) and visitors to the tower can also enjoy spectacular views from the observatory in the tower’s Sky Pod, some 1135 feet above street level. Here there is also a revolving restaurant and a glass floor on the observation deck. Toronto, located in the south of the province Ontario is Canada’s provincial capital city and the most populous area of the country. Not only this but it’s also one of the world’s biggest and most successful financial centres, so it’s not just a tourist or suburban area. Largely due to the CN tower itself some of the leading industries within Toronto include television production, telecommunications and media. Tourism is also a very successful market here, meaning there are plenty of places for visitors to stay and sights for them to see during their stay. Construction of the CN Tower began on February 6th 1973 and finished in March 1975 when the antenna was constructed. A total of 1537 workers joined in the building of this structure that is estimated to weigh and immense 130,000 tons. Near the top of the tower is the 360 restaurant which revolves to show diners the full view over the city and surrounding regions. Each revelation of the restaurant takes 72 minutes and at any one time it can hold a maximum of 400 people. In terms of broadcasting, the CN Tower is capable of transmitting FM Radio, VHF Television and microwave transmission amongst various others. There is one main airport in Toronto, providing a quick, simple and direct way for international visitors to see the CN Tower. Upon arriving at the Toronto airport visitors then have a number of options for getting to their accommodation and around the rest of the city. Of course residents of the United States, or those who have travelled through there can simply drive through by car or bus, or take a train journey. Renting a car is generally quite easy but it should be noted that Toronto becomes very cold in Winter and those who are inexperienced in driving in snow and ice should be careful. For visitors looking for a luxury stay in Toronto, the nearest four to five star hotel is the SoHo Metropolitan in the theatre and entertainment district. The Windsor Arms is a cheaper hotel but one which still offers very high standards of service, on St. Thomas street a little further North. Most hotels can be reached easily via the metro, street cars or bus routes, although following a long flight you may wish to take a taxi from the airport to your hotel first. From there it’s a good idea to gain public transport advice from the receptionists where you are free of bags and well rested. There is a subway system, several bus routes and also some street cars to take you around. Day and weekly passes for the buses and the metro are recommended if you want to get around and see a lot during your stay as this will save you money overall. Although the Channel Tunnel was a 20th century venture, the idea to link Great Britain with France was one that had been around for 192 years before it was actually built. In the early 1800s engineers proposed an under-sea tunnel, but fears over breaches of national security thwarted the plans and nothing was attempted until 1988 when construction on the Channel Tunnel, or ‘Eurostar’ began. It took six years to build the tunnel and the opening ceremony in 1994 involved French president Mitterrand and the English Queen taking channel tunnel trains from their countries which touched nose to nose in the center, to symbolise the new connection between both nations. Today the channel tunnel, commercially known as ‘Eurostar’, now runs services from London to Calais, via the tunnel itself and also via the Channel Tunnel Rail Link at St. Pancras station. At its deepest, the channel tunnel dips to 250 feet below sea level and services do not just include train services for passengers, but freight trains and services for vehicles too. Customers can park their vehicles on the ‘Eurotunnel Shuttle’ train where they are free to either stay inside their vehicles, or walk around the carriage. The Channel Tunnel itself runs through the English Channel from Folkestone near Dover, England to Coquelles in Pas-de-Calais, France, although in England there is the Channel Tunnel Rail link which extends from Folkestone back to London St. Pancras. Neither Folkestone nor Coquelles are notorious tourist spots, but it’s incredibly easy to travel from these final Eurostar destinations to more ‘built up’ areas of interest, such as the French capital of Paris, where L’arc de Triomphe and the Eiffel Tower can be found, or London where many people like to visit Buckingham Palace, Westminster and Big Ben. Even though this 50km under-sea tunnel has only been around since 1988, the structure has some intriguing and surprising stories attributed to it. To start with, the original cost estimation was 80% less than the final construction costs, which reached £4650 million, although the final cost of the entire project has been said to be approximated £10 billion. With a workforce of 15000, construction spanned seven years and met in the middle of the two countries when complete. There was a fire in the channel tunnel in Winter 1996, although normal service resumed just three days after it happened and nobody was injured. Within the UK it’s easy to get to the channel tunnel via the Channel Tunnel Rail Link in London St. Pancras station, as all main towns and cities have services to there. If you are driving to the channel tunnel in the UK then exit the M20 motorway at junction 11A. If you’re coming from the other side in France then leave the A16 motorway at junction 42. From there you can find somewhere to park by the checking in booths, or board the Euro Shuttle inside your vehicle to drive to specific destinations in on the other side. Coquelle in France has been mainly built up around the fact the Channel Tunnel entrance is there. As a result there are restaurants, supermarkets and most importantly a range of hotels from budget to luxury, including Etap and Ibis. In Folkestone passengers on the Channel Tunnel might like to stay in the Salisbury hotel which actually overlooks the English Channel, or the Burlington three star hotel and The Carlton hotel which are both also very nearby. Rather than staying at a hotel in these areas many Eurostar passengers prefer to take another short train journey on to London, Lille or Paris. From either end of the channel tunnel it’s easy to catch connecting trains or buses to more built up areas. The Channel Tunnel Rail Link takes you right to central London, where you can travel onto smaller regions, or sightsee. Residents of France or the UK can take their vehicle onto the Euro Shuttle where they join the motorway and navigate to their final destination that way. In 1930s America, on St. Patrick’s day (March 17th) a team of workmen in Manhattan, New York embarked on what was to become the world’s tallest building for almost half a century onwards. The Empire State building was to join the Chrysler and 40 Wall Street buildings in a fight to become the tallest building on the planet. 410 days and almost $41 million later, construction of the Empire State Building finished. The time it took to complete remains a record for a building of its height to this very day. It was officially announced open on May 1st 1931, when the US President at the time Herbert Hoover switched on its many thousands of lights. Today the building is celebrated for its early 20th century Art Deco style and with public tours of its floors. On days when the weather permits, visitors can see the states of Massachusetts, New Jersey, Connecticut, Pennsylvania and NY from the building’s observatory on its 86th floor. Not only is the Empire State Building one of the seven wonders of the modern world but it has also been hailed as a National Historic Landmark, giving testament to the seven million man hours it took to build, and the incredible race for the title of world’s tallest building, which was such an incredible feat at the time. The Empire State Building was built on 5th avenue in the metropolitan New York borough of Manhattan. Fifth avenue itself is home to some of the world’s most prestigious shopping centres and stores, such as Saks, Gucci and Banana Republic. As the Empire State Building is located in one of the most popular tourist destinations in the US, it attracts a huge number of tourists during both the summer and winter seasons (New York is particularly atmospheric at Christmas time). Fifth avenue also runs along Central Park’s eastern edge, meaning visitors to the Empire State Building can see the park in its entirety from the observatory on floor 86. Empire State Building visitor tours are jam packed with facts, so we won’t spoil it for you completely. We can, however, tell you that there is an incredible 1860 steps to the 102nd (topmost) floor. Don’t worry though, you won’t have to climb them as there are elevators and escalators taking visitors to the most important floors of the building. You won’t be able to visit the very summit of the building, as this is 443 metres above ground level and marked by the top of the lightning rod. This metal structure gets hit by bolts of lightning approximately 100 times every year, protecting the surrounding buildings and area of New York from being hit during electrical storms. The easiest way to get to New York is to fly to one of its three airports. The John F Kennedy (JFK) airport in Queens is the biggest and is the most likely to provide flights to and from your destination. From there, take a taxi ($45 not including tip), Express Shuttle Bus or the New York City subway. The latter two will cost you just $2.00 to and from the centre of the City. From there you can take a taxi or bus from your hotel, or walk around the city to see the other sights at the same time. To visit the Empire State Building itself you will need to buy tickets for entry, which range from $15 to $20.50 depending on your age. However, if you’re part of the military and are in uniform you go free, as do toddlers under the age of five. If you wish to visit the observatory as well then you will need to pay an extra $15. The range and diversity of hotels and accommodation in Manhattan is large. If you’re looking to really splash out for a luxury stay then try the five star Lowell Hotel just off 5th avenue where double rooms range in price from $850.00 to $1650 per night. For a mid-range but stylish and comfortable hotel try The Crowne Plaza in Times Square (1605 Broadway) from $299 to $899 per night. Good budget hotels include The Jane Hotel where rooms start at just $99, or the trendy ‘Ace Hotel’ right near Madison Square Park. There are hundreds of taxis in Manhattan, but prices depend on where you stay and where you go. Ask your hotel receptionist how much a fare to the Empire State Building is, or whether you can buy an all-day bus pass to see other sights. There are taxis or buses to the nearest subway station; the subway is generally the cheapest form of transportation in New York.